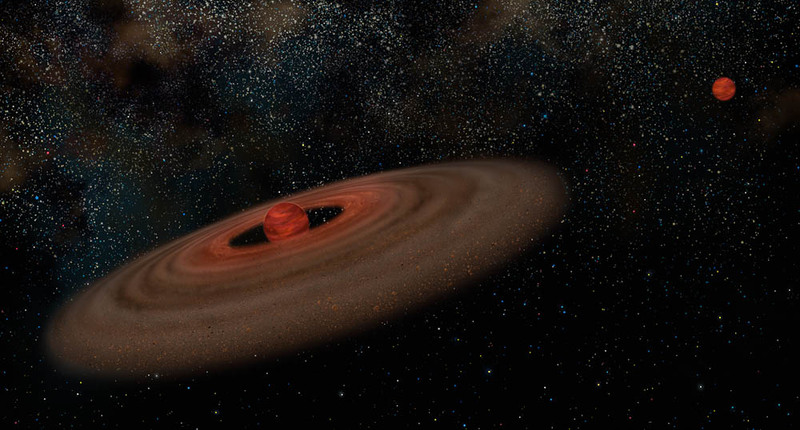 Artist's conception of the binary system 2M J044144 showing the primary ~ 20 Jupiter mass brown dwarf (left) and the 5 - 10 Jupiter mass companion (right). The disk of the primary likely never had enough material to make a companion of this mass. As a result, this small companion probably formed like a binary star. In this illustration, both objects are presented at the same distance to show relative sizes. Not shown are two other nearby objects, a low-mass star and a brown dwarf that are probably both parts of this system. See Press Release for details Full Resolution TIF (24.6 MB) Medium Resolution JPG (139 KB) Gemini Observatory Image/Video Usage Policy Link to wallpaper.